Meet Gretchen and Rubin…and Dezi and Oscar too! After 23 years of teaching, Gretchen retired and started her own business as a dog walker in 2008. In 2010, she studied small animal massage at the Northwest School of Animal Massage and shortly after, studied Traditional Chinese Medicine and Small Animal Acupressure at the Tallgrass Institute. 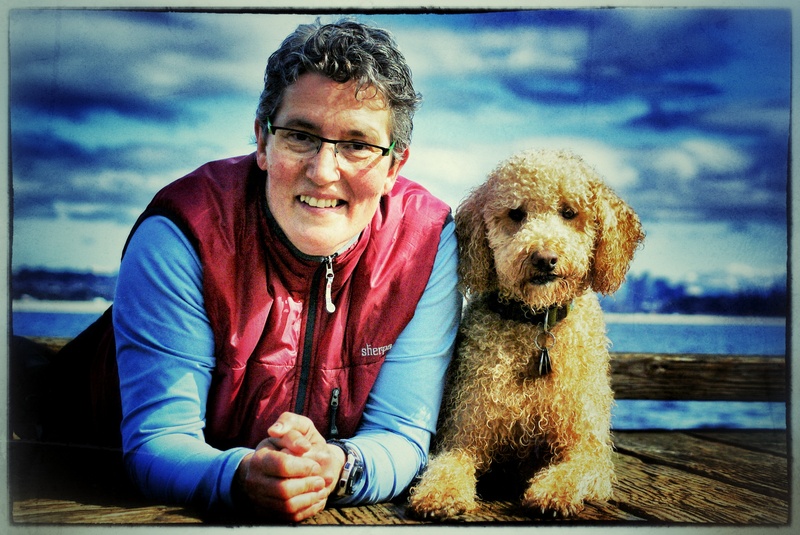 Gretchen is a Washington State Licensed Small Animal Massage Practitioner (SAMP) and is Nationally Board Certified in Small Animal Massage and Small Animal Acupressure. Working and training at a swim therapy pool, in addition to her SAMP credentials, Gretchen has learned a variety of techniques and skills to help dogs with a multitude of issues find comfort, relaxation, and renewed energy through focused massage, therapeutic swimming, and gentle stretching. 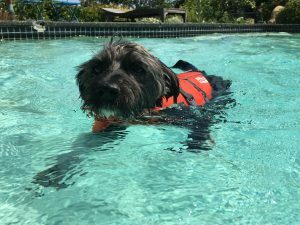 She will come to your home to provide a massage/acupressure session or you can contact her to schedule a swim session for your dog at Aqua Dog Spa in Kent or Splash Dog Spa in Edmonds. 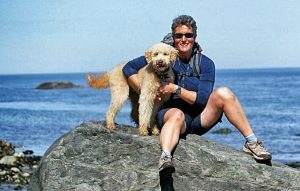 Rubin, my Labradoodle, came into my life in 2007. He started it all, so to speak, as he became my constant companion and even came to school with me when I was a teacher. He was the reason I started the dog walking business and he was all the reasons I started my studies in animal massage, swim, therapy, and acupressure. Rubin LOVES to swim and was my “practice” dog while studying massage and acupressure. He has benefitted greatly from all the modalities and remains healthy and strong in his senior years. Rubin thought he was going to be the main dog in my life, but after a difficult passing of a friend, we adopted 12 year old Dezi who lived with us until he was almost 16 years old! 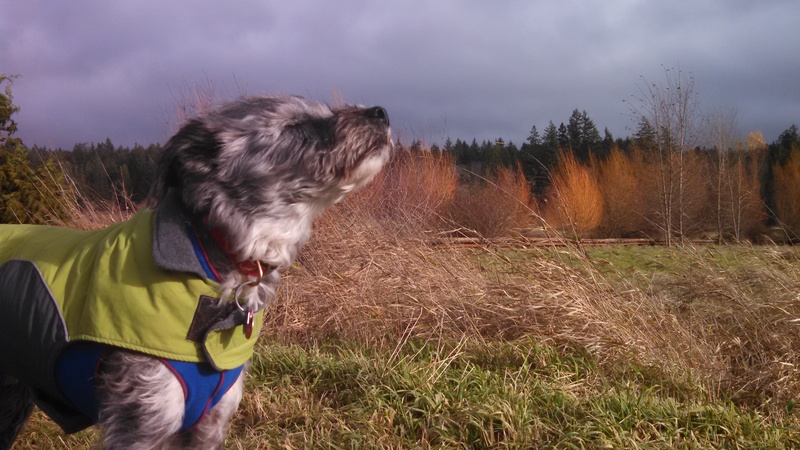 Dezi gave us such joy for over three years and our only regret is that he wasn’t a member of our pack earlier. He taught us all about love and patience and helped me personally understand the often complex and winding road of senior dog care. We said goodbye to the old man in June of 2017 and every day miss his sweet disposition and persistent insistence that roasted chicken cured all that ailed him. And then came Oscar…a rescued dog for Costa Rica (long story!). Though Oscar looked like a mini version of Dezi, he was the opposite personality in so many ways. Where Dezi was contemplative and calm, Oscar is an alert and a silly tough guy. After living on the streets of Costa Rica, he learned a thing or two about begging, flirting, alerting, and claiming the street as his own. He had a special fondness for Dezi and loves to play and run with Rubin. Oscar came with a number of health concerns all of which we have treated holistically with great success. He has learned to love massage and acupressure and is doing his best to understand the benefits of swimming. On our site you can find out about the adventures we take, the dogs (and cats!) I work with therapeutically, and my insights on life, family, and friendship. Check out our blog, Wags n’ Words. Please give us a call if your canine companion needs needs massage, acupressure, or swim therapy. We’d love to meet you and help out however we can!